As she unpacks in her new bedroom, Ella is irresistibly drawn to the big old house that she can see out of her window. Surrounded by overgrown gardens, barbed wire fences and ‘keep out’ signs, it looks derelict. But that night, a light goes on in one of the windows. And the next day she sees a girl in the grounds. Ella is hooked. The house has a story to tell. She is sure of it. 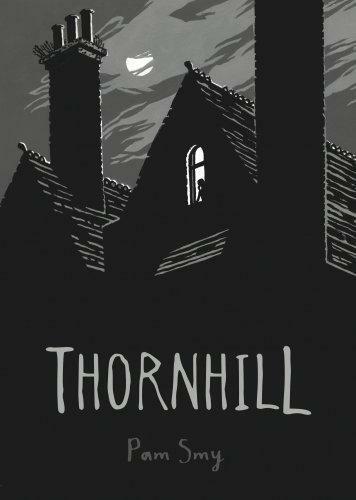 Thornhill is a beautiful book, from its striking greyscale silhouetted cover to the pages in-between. The book contains two stories set in two different times. Mary’s story is set in 1982, in a children’s home called Thornhill. It’s told through her diary entries and is not a happy one. Mary is an intensely shy selective mute who is tormented by another girl at the home. This girl (only ever referred to as she or her) is horrific, torturing Mary in every imaginable way, from shoving her in a pantry and locking her in overnight to standing outside her bedroom at 2am THUMP… THUMP… THUMPING on her door. As Thornhill closes and the other girls are rehoused, Mary and her tormenter are left alone and Mary reaches her breaking point. Slowly the two stories combine into one, becoming more harrowing with every page turn: the tension building until you’re reading faster and faster, desperately trying to finish the book before dark. Breathtakingly scary in the best possible way, Thornhill is excellent for anyone 13 or older who loves ghost stories. Dani Solomon is a children’s and YA specialist at Readings Kids.